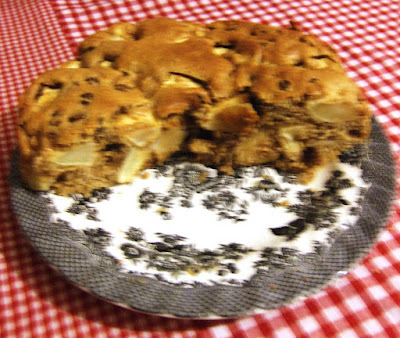 I've been searching for the perfect Apple and Cinnamon Cake recipe to satisfy a craving for a cake my Ma used to make. She remembers the cake but not the recipe. I've tried a few and this one comes close, I think. Though it still doesn't have the dark and bready quality that I'm longing for. I've adapted it from a recipe I found in the Kilkenny Cookbook. It is a 'work' cake and I am a lazy, impatient baker, so this is one for when I have the inclination to be more fiddly - and the time. Excuse the blurry photo; I don't know why but lots of the photos we take lately seem to be blurred. Getting old?! It's just to give an idea of what it might look like. Cool in the tin on a wire rack for ten minutes, then take it out and carefully peel off the paper. Delicious hot or cold, with soy cream, ice-cream or custard. Or on its own with a cuppa!